Wouldn’t it be great if you heard this at work more often? In a cross-functional meeting. In a 1:1 with a report. In a conversation with your boss. Imagine all of these interactions being framed through what you hold in common, versus spiraling into fits of conflict and disagreement. This is the observation behind Lawrence Ripsher’s 90% Agreement Rule. “We spend 90% of our time talking about the 10% of the things we disagree on,” he writes. In our interactions as managers and humans, this tendency to focus on what we disagree on is draining. It creates tension in our relationships, saps creativity, and stalls forward momentum. But as Ripsher points out, pick another colleague from your company, and you’ll probably agree on most things. “Actively look for common ground by asking ‘what do we agree on,’ ‘what shared points of view do we have,’ ‘where are we aligned?’” he says. “As these are shared, write them down.” I find this last note to be very helpful. By putting down what you agree on paper (or a whiteboard) you externalize these items so you can continually return to them. Capture areas of disagreement in some way, but put them aside to focus on later. 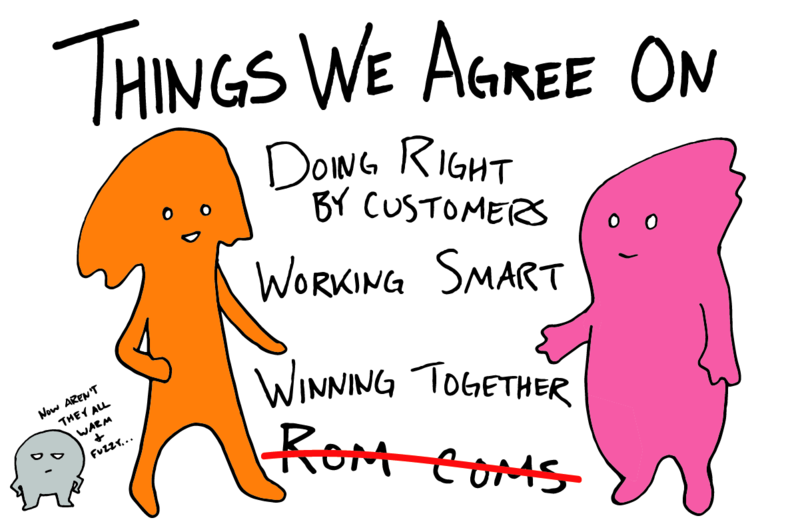 At every step, dig in to ensure there’s actual agreement. A good tactic is to role-play. “Have individuals try to express the other person’s point of view to make sure it’s roughly aligned,” Ripsher writes. Finally, once you’ve clarified what you agree on, return to the areas of disagreement and work through them. The 90% Agreement Rule encourages a subtle context shift. Often, that’s all it takes to get back on track. Next time you find yourself veering into conflict, take a step back, and try agreeing to agree.